The AR-ONE MAXX Fifth Wheel is one of the newest editions to the Starcraft family. Interior features of the fifth wheel series include three-burner gas range, microwave, high-rise kitchen faucet, backsplash, cherry cabinetry and cable TV prep. Available exterior features include galvanized steel wheel wells, aluminum rims, bumper-mount grill and an Extreme Package that adds 5 inches of extra ground clearance. 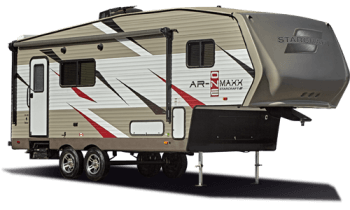 The AR-ONE MAXX Fifth Wheel has sleeping capacity for up to 10.